The following before & after pictures were all taken of clients that had received a series of Rolfing treatments, with Advanced Rolfer and PTX therapist George Beahan! Please notice the progression from a collapsed, almost defeated structure, to a more upright and open structure. 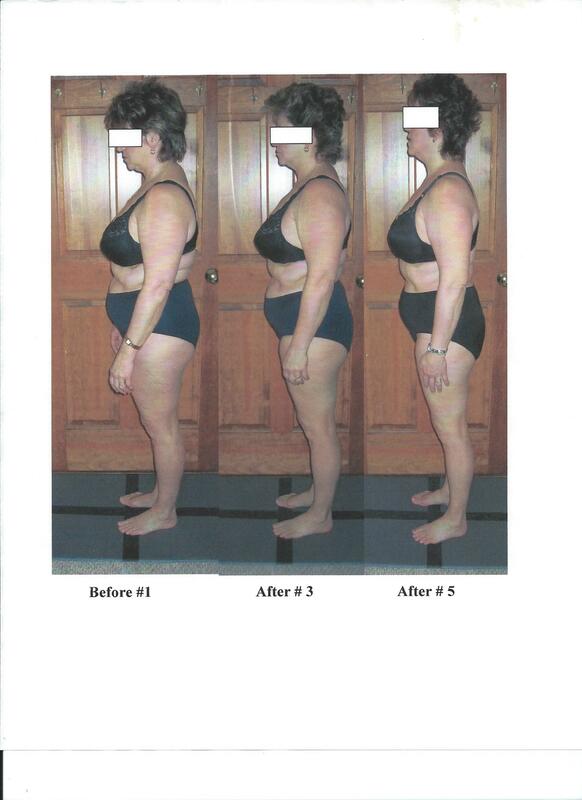 NOTE: this client or any of the clients on this page, did not lose weight. It only appears that way due to the lengthening of the fascia! 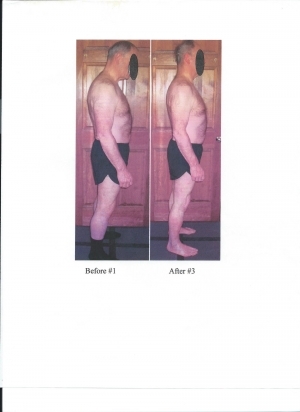 This particular client, most notably had a thorax, or rib cage, that sagged and lacked lift. in addition her pelvis is tucked under due to weakness in the hip flexors. When this happens in a persons structure, there is a severe strain that happens in the cervical vertebra (neck), that causes an unsightly hump (called a dowagers), at the base of the neck. Not only is this unattractive, but the person experiences chronic pain in the neck, shoulders, upper back due to this pattern! Many times there is a nerve inpingement, that causes numbness and tingling in the hands or fingers or pain in the wrist or elbow! The good news is that this pattern, as well as many structural patterns can be changed! By lengthening the fascia (a type of connective tissue), and rebalancing the body with structural exercises you are lengthening and strengthening to alleviate these nasty, painful, dysfuctional patterns! This client is in some ways the exact opposite to the client above. 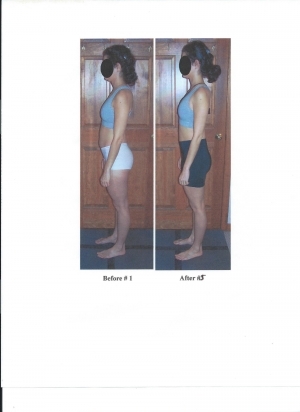 Instead of the pelvis being tucked under, indictaing a weak core or hip flexors, this clients' pelvis comes over the top. Coming over the top produces a very large curve (lordosis) in the lower back, resulting in pain in the low back pain from overly tight hip flexors. Many people with this structural condition will also experience shin and knee pain, with sore tired feet. In the case of this client, one of her main complaints was pain in top of her her scull. Since the whole body is truly one unit, or interconnected, after other interconnected areas of fascia were released the pain in her skull went away! This condition called "forward head syndrome" can become very painful as the head becomes cantilevered from the spine. In the Physiology of joints (volume 3), Kapandji said:" For every inch of Forward Head Posture, it can increase the weight of the head on the spine by an additional 10 pounds." You can imagine the stress that the muscles of the upper back, shoulders and neck are put under. No wonder this condition becomes so chronically painful! Adjusting the bones in the neck will not change this condition! Only by manipulation of the soft tissue (fascia) by Rolfing or by lengthening and strenghtening with PTX therapy will you allow the head to align with the spine. This client has a functional scoliosis. 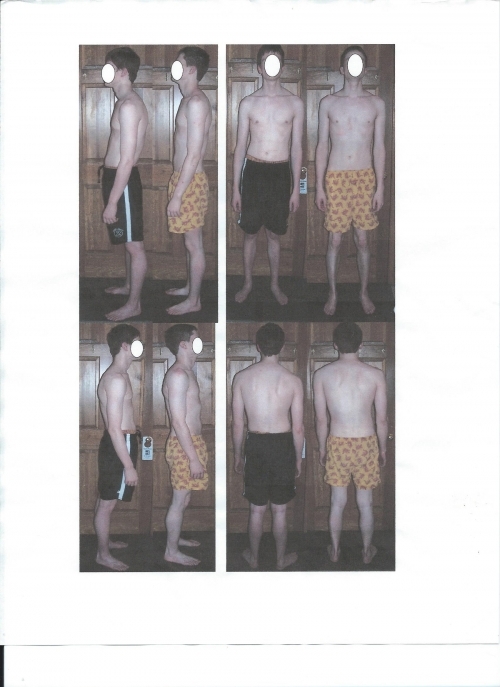 As you can see in the front & back (before view in black shorts) views, there is an obvious twististing in his structure. In the side before view, you can see that the head, shoulders, pelvis, knees and ankles do not line up, if we were to draw a verticle line through the body. These dysfunctional misalignments can and do cause chronic pain patterns throughout the body. In the after views, (orange shorts) the client is much straighter and longer in the front and rear views. In addition, notice that the feet and legs are no longer turned out. This is important to the correct function of the joints of the hips, knees and ankles. In a sense, you can compare it to a car being out of alignment. In a car, the tires and other parts will start to wear and break much earlier than expected. In our body the misalignment often takes its toll on our joints, tendons and ligaments. Rolfing and structural exercise, can keep this from happening through lengthening of the fascial lines of the body and stregthening strutural weaknesses.